I had spent the afternoon recording a video but I've had technical difficulties with the sound being out of sync. It's very frustrating so I am now here writing this post instead. 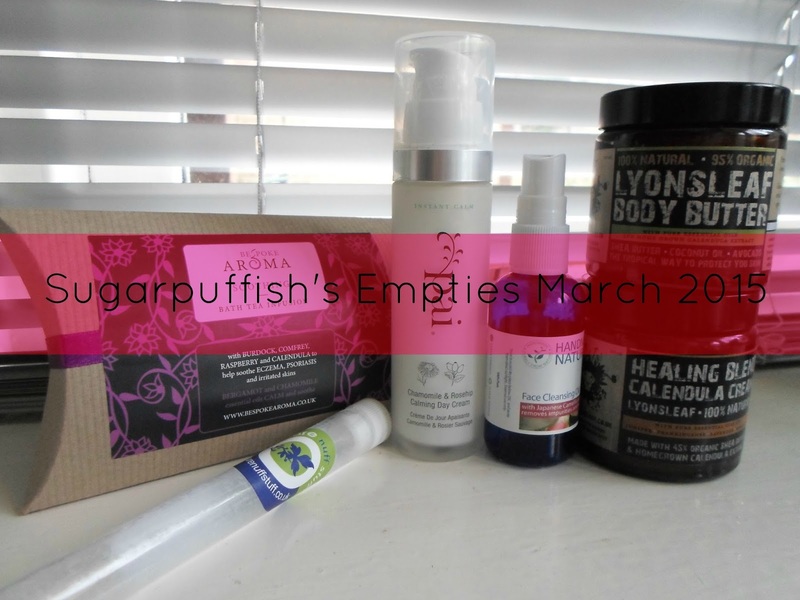 I did not have many products in the empty basket this month. Bespoke Aroma Soothing Bath Tea* - a tea bag for the bath tub is an interesting product idea which I enjoyed using. These would make great gifts or treats for yourself. Handmade Natural Cleansing Oil - one of my all time favourite brands and I love this cleansing oil. The ingredients stand out as being a little different to other oils. I will buy again in the future, this was my third or fourth bottle. Lyonsleaf Body Butter & Calendula Cream* - these jars are not quite empty but they are past their best before dates (Sept & Oct 2014). I liked both butters but did favour the calendula because it's an ingredient I love. It does sadden me that I couldn't reach the bottom as I hate to waste product. I will repurchase the small jar in the future. Pure Nuff Stuff Arch Angel Foot Soak - I like to pamper my feet and enjoyed using this soak. Affordable and fun packaging was a key factor to recommending these bath shots. I'd love to try Lyonsleaf! Their products sound amazing.